Because of the need to get back to the station for the return journey home, I left the stadium yesterday immediately upon the final whistle and so missed what turned out to be an interesting event. But fortunately my pal Steve who sits next to me in the East Stand did stay, and texted me the details. During the game we’d been discussing the reaction of the Arsenal crowd to Giroud while he warmed up. That reaction was totally positive – no chants of “Arsenal reject” and the like, but instead a rousing round of the Giroud song based on “Hey Jude” by the Beatles. And this from the Arsenal fans, I should stress, not the Chelsea supporters who remained subdued throughout most of the match. Now Steve put forward the point of view that this wasn’t the best thing for fans to do while our guys were out on the pitch battling to hold onto the 2-0 scoreline, and I could certainly see his point. But then crowds are not particularly known for their ability to choose logical or indeed helpful behaviour. This was Giroud’s first return to Arsenal. I for one was sorry to see him go when he moved to Chelsea, but given that Chelsea were willing to pay £18m for him, and given that I was of the mind from the end of last season that money would not be as freely available to the manager as many journalists and bloggers suggested through the summer, I felt it could be a good move for player and club, as it helped us fund the purchases of Sokratis, Leno, Torreira and Guendouzi. But although those have been great buys for Arsenal this hasn’t been a good move for Giroud. It’s now been a year since he went yet he has only around 20 starts for Chelsea – although that moves up to 31 appearances when you include the times he has come on as a substitute. But the goalscoring has not been there – he’s knocked in just four for them. Maybe it is a bit of sarcasm relating to the way he rarely gets to play 90 minutes for he was reported to be very angry about being substituted in the Brighton game, so perhaps it was just a shorthand way of saying he doesn’t like it. Yes of course, Manchester City and Liverpool have better home form than Arsenal but even so, what we can see is a continuance of last season’s home dominance, which ended with us as the second best home team in the league. This was the side of our performance last season that was ignored by the media, but which led to the suggestion on Untold that if only we could improve our away form we could well get back into the top four. That is still the issue, although with four wins and three draws away from home this season we’re just one point behind the away total for the whole of last season – with eight away league games left to play. The goal difference is better too; last year it was -11 away from home (20 scored, 31 against); so far this season it is zero (22 for and against). We’re three poits off Chelsea, and although they can hardly be said to be in a bad run they are slipping up occasionally. My prediction for Tottenham from the off has been that they would struggle at home, as virtually every single club that changes ground does just that. I suspect that once they move to New White Hart Lane (Newhl) they will indeed stumble further, and it could be a final 1-2-3-4 of Liverpool, Man C, Man U and Arsenal (although not necessarily in that exact order). A good win yesterday against a formidable opponent and maybe we are back on track for the hunt of a top 4 finish. However the following points to be noted. 1) We lack the pocession 38% and the attacking threat . 2) We were too much defensive and had Chelsea played Hazard in his natural position with a striker up top we could have been in trouble. 3) Seems UE does not rate Ozil qualities and prefers a combined team effort over an individual who is a match winner if played to his strengths. 4) We won the match but it was not an eye catching stuff . Missing Wengerball big time. 5) A cleansheet with Bellerin Kos Kola Xhaka. all Wenger boys proves that these players are not the problem. Actual problem lies with the Wobs heads who keep on slagging/ abusing Wenger for all his deeds. 6) Still wondering how these Wobs will celebrate a top 4 finish which they think is a non achievement for 20 years and now they want to die for….. Watching Lacazette “live” shows how hard he works both on and off the ball and his energy is used in a different way to Aubamayang, who doesn’t get involved in so much of the build up, but uses his pace to try and stretch the defences and doesn’t have as much physical contact with opponents. Lacazette seems to relish a tackle and works really hard to keep or win the ball back. Hence Unai Emery takes him off before Aubamayang. Sometimes it seems, to me, like the wrong choice and he gets visibly upset but I wouldn’t read too much into the bye bye hash tags. His goal yesterday was brilliant and he is so much more than a goal scorer, so don’t do what the tabloids do and pick up a negative and concentrate more on the team performance and what an important three points it was for our top four aspirations. As for Giroud, it was great to hear the appreciation for his career at Arsenal and how much he loved his time at the club. And thanks for the timely reminder that we ended up second best on home form last season, Tony. Jamie Carragher was at it again and slapped all over the media. Blame Arsene. I am thoroughly sick of it. The man has been gone eight months and still at every turn ridiculous criticism of him gets trotted out. If we are not careful all his massive achievements for our club will be wiped from memory by these people. If you repeat a lie often enough it becomes the truth. (a) the nature of news media that publish their rantings e.g. – mail; sun; express; telegraph etc -to name but a few publications with a fixed social and nationalistic agenda! (d) Many pundits still appear to be anti-Wenger and still cannot comment on the club without the false assumptions about the manager and the legacy that he has left. (And yes he was well paid whilst at the club!). (e) Pundits take themselves too seriously. Football is a sport, an entertainment……It should not rule one’s life nor give rise to serious tribal differences that lead to violence and discrimination. Having aired my pundit grievances, I must add that I read UA as I like much of what it has to say and for me it is rooted in analysis whenever possible from people whom I do not know but who I enjoy reading, especially your observations and comments. It is good that this site acknowledges the Girouds’ of this world and the contributions that they have made to this football club. It is so good that this site does not lambast past and present players, (unlike some so-called Arsenal followers and indeed, past players). ‘Untold Arsenal -supporting the club, the manager and the team’. One does not have to repeat this often enough, for it to be the truth, simply because it is not a lie. Untold Arsenal allows us all to contribute in the positive support of the club and allows for dissension provided such dissension is mooted in evidence or analysis. Punditry, the News media, including the tv/radio media, have their associated social and nationalistic agendas, they just happen to be different to that of UA. Time to forget Wenger , just harping back and comparisons are of little point. Rosicky , you miss Wengerball but I welcome that the way we played yesterday we played with a tempo that did not allow Chelsea to play their game we harried and pressed and played with pace. Sure Wengerball was great with Henry , Pires and especially Bergkamp but as the ability of the players became poorer it became outmoded and ended up a steile somewhat limited system easily combatted especially away from home . In his time Wenger was a genius but his time was run and it was time for the club and it’s supporters to move on. OT: Transfer – Central defender Björn Engels? I know nothing about this person. He apparently likes the idea of getting to the EPL, and possibly fancies Arsenal. However, his wife is from Liverpool. I hope Krystian Bielik isn’t hurt after getting “tackled” by a Charlton fan/pitch invader (he is on loan to Charlton). For me it’s not about moving on, as you say things change, managers, players, owners, that is life. It’s about defending Wengers legacy that many in the media and way too many of our own fans seem determined to destroy at every turn. Every accolade for Emery it seems has to be followed by an insult for Wenger. And whilst this continues I hope at least here on Untold we stand firm in our defence of the great man, his many achievements and his incredible legacy. If Carragher and the like stop their constant attempts to undermine Wenger then perhaps we/I won’t keep feeling the need to defend him. Nitram Don’t get me wrong I enjoyed most of the Wenger years but I also enjoyed the Graham and Mee ones. Winning things is fun and upsetting a clique of media talking heads that in Fleet street times were predominately Tottenham or West ham fans is par for the course . It has never been different . Our fairs cup and 70 – 71 double teams were never lauded and Graham’s team was boring despite scoring 80 plus goals in our 91 – 92 season league win . They concentrated on Adams incarceration and the brawl that Mclair started and our deduction of two points. It’s always been the same during my lifetime , my father said it was true of his too including the war time interruption . There has always been an anti Arsenal attitude and the best way to counter it is to pick your times to bring up ou successes in comparison to their chosen flavour of the month. Don’t rise to it and they will subside , they will never go away but all the time they get a bit more oxygen they will continue to spout their bile. You sound as if you are of a similar age to myself and indeed the way we are derided now is just par for the course. The 70’s it was ‘lucky Arsenal’ then ‘boring Arsenal’ then ‘foriegn/French’ Arsenal. You suggest starving the critics of their oxygen with silence, and that is of course an option, but alas not one I agree with, because as the saying goes “All that needs to happen for bad men to succeed is for good men to do nothing” or in this case ‘All that needs to happen for lies to become truth is to allow them to go unchallenged’. Giroud his legs left Arsenal but his heart is still with us. 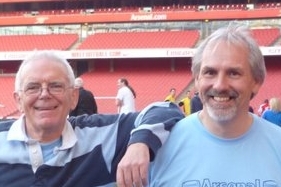 It was lovely to see all the love yesterday but it did bring a wry smile to my face as remembered the amount of times myself and many others here on untold, including yourself I believe Walter, found ourselves putting up rigerous defences of his ability as we were constantly told he was ‘not Arsenal quality’ despite the reems of statistics we produced as evidence to the contrary. Loved the guy when he was with us and always thought he was class. Great to see he still is. Giroud was a valuable member of the squad and would have been ideal to put on yesterday when we needed to hold the ball up field towards the end . Once we took off lacazette we found it more difficult to play in their half and consequently gave the impression that Chelsea improved. It’s hard to criticise Emery’s substitutions for that because AMN was immediately forced to cover for Bellerin and the manager’s plan had to change before it had a chance. What to do about the lack of Bellerin if we don’t buy. Personally I would not want AMN ‘s progress as Ramsey’s successor prejudiced by playing him at fullback , he needs playing time as the midfielder he is otherwise he will remain a prospect . Lichsteiner is not able to do it week in week out so I would go for Jenkinson for his athleticism and work on his play to improve him. Not sure it’s fair to say Giroud’s move has not worked out for him. It’s impossible to say how things would have played out if he’s stayed, how many starts he’d have had, and how many goals he would have scored. But he left we are told because he was worried about losing his place in the French team. He went to Moscow, played almost every game, played the final, and has a winner medal. Regarding the Arsenal fans singing the Giroud anthem, some credit should go to the Chelsea fans who displayed a banner acknowledging the years Peter Czech had played for Chelsea and his imminent retirement at the end of this season.